Teri Klassen, “Representations of African American Quiltmaking: From Omission to High Art,” Journal of American Folklore 122 (2009): 297-334. Shelly Zegart, “Myth and Methodology,” Selvedge, Jan/Feb 2008. Kyra E. Hicks, Black Threads: An African American Quilting Sourcebook, Jefferson (NC: McFarland & Co, 2003). Cuesta Benberry, Always There: The African-American Presence in American Quilts (Louisville, KY: Kentucky Quilt Project, 1992). Just as individuals’ identities are categorized using racial terms, so too have observers classified quilts. Yet the only racialized term with frequent use in describing bedcovers is “African American quilts,” rather than “White quilts” or “Latino quilts” or “Asian quilts.” In recent decades quilt scholars have debated African American quilts’ meaning, aesthetics, and value. The authors listed in the resources here have explored these debates in detail, and their work is the perfect place to turn for in-depth discussions of the history of interpreting African American quiltmaking traditions. 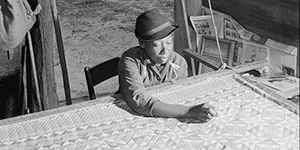 The condensed version of these debates centers on whether there is anything distinctive about quilts made by African Americans, specifically whether these objects reflect African design sensibilities or characteristics of improvisation. In the past decade, quilts made by a group of African American women from the isolated Alabama community known as Gee’s Bend have gained prominence through art museum exhibitions and accompanying publications. Widely praised for their strong graphic compositions, these quilts only intensified beliefs that African Americans typically made a certain sort of exotically abstract quilt, rather than ones aligned with trends of American interior design and consumer culture. 1. See Maude Wahlman, Signs and Symbols African Images in African-American Quilts (New York: Studio Books in association with Museum of American Folk Art, 1993) and Cuesta Benberry, Always There: The African-American Presence in American Quilts (Louisville, KY: Kentucky Quilt Project, 1992). Read more about Do Quilts Have Ethnicity?